Welcome to Isotopes Stadium, home to Albuquerque's minor league baseball team, the Isotopes. Isotopes Park is known locally as "The Lab." The Albuquerque Isotopes played their first professional baseball game on April 11, 2003. The team is part of the Pacific Coast League, American Southern division, and are the minor league team affiliated with the Los Angeles Dodgers. The stadium was renovated prior to the Isotopes' first season in 2003. Before that, Albuquerque had the Dukes baseball team from 1969 to 2000, in what was known as the Albuquerque Sports Stadium. Once inside the stadium, the concourse provides signs that indicate where to find seats by number. Wrapping about 2/3 of the way around the ball field, along the concourse, game visitors will find food carts, concession stands, and the gift shop, where Isotopes gear can be found. While walking the concourse, take a breather with Homer Simpson. He sits on a bench near his wife, Marge. Both offer passersby a chance to take a picture with the famous dad. The Simpsons came to the stadium via Los Angeles, where they were found outside an eclectic furniture store. They were brought to Albuquerque and given a fresh coat of paint. In keeping with their location, Homer received an Isotopes game ticket, and Marge got a bucket of popcorn. It's only fitting that they found a home at Isotopes Park​ since it was the Simpsons animated television series that spawned the Springfield Isotopes, the Simpsons' hometown team. Homer loves the Isotopes, and in one episode, he even went on a hunger strike for them. Now that's a die hard fan! Berm seats are an affordable way to watch the game. 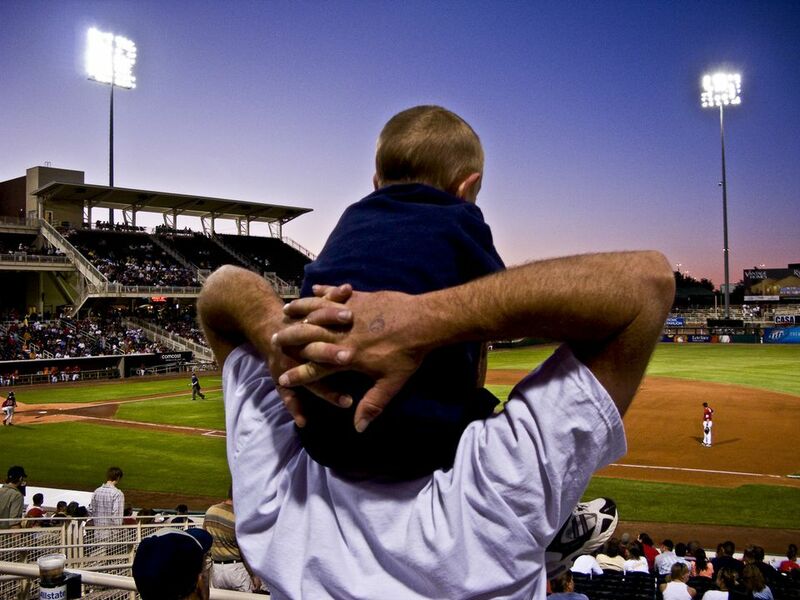 Families can bring children and allow them to move around, and everyone can enjoy the game. Berm seat tickets are available for purchase the day of the game. The grass is comfortable but blankets make it even more so. There are many levels of seating at Isotopes Stadium, from the very affordable to box seats. Seating is decent across all the different levels, including berm seating, though some are just better than others. Tickets for home games can be purchased singly, for the season, or with a flex plan that can be customized to your needs. There are also combo plans that feature a book of Baseball Bucks which can be spent in the ballpark. Families can purchase tickets for the Fun Zone while at the game. The area contains slides and play structures, basketball, batting cage, a putting challenge, speed pitch, inflatables, a carousel, and drop tower. The Fun Zone is located beyond the berm in right field -- tickets can be purchased individually or by the sheet. Unlimited all day passes are available for groups. Of course, watching the ball game is what heading to Isotopes Stadium is all about. Be sure to check the current schedule to find out when there will be hometown games. Look for promotion nights and nights when fireworks will be set off after the game. They're just a few more reasons why it's fun to go out to the ball game. Batter up! Catch an Isotopes Home Game!